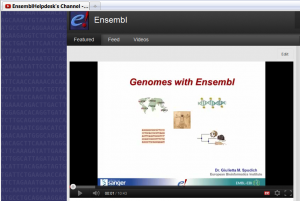 I am working in Ensembl Outreach, and I’d like to point you to some new videos we have on our YouTube channel. These 5 videos were requested from clinical researchers at the Erasmus MC in Rotterdam. The Ensembl Overview takes you through some Ensembl data and analysis, with a focus on where the gene set comes from, and sequence variations. We’d like to know what other videos you want to watch. Drop me an email, or add as a comment to this post. Thanks! Next Next post: Ensembl 66 has been released!